What is steam?—The mechanical energy of steam—The boiler—The circulation of water in a boiler—The enclosed furnace—The multitubular boiler—Fire-tube boilers—Other types of boilers—Aids to combustion—Boiler fittings—The safety-valve—The water-gauge—The steam-gauge—The water supply to a boiler. If ice be heated above 32° Fahrenheit, its molecules lose their cohesion, and move freely round one another—the ice is turned into water. Heat water above 212° Fahrenheit, and the molecules exhibit a violent mutual repulsion, and, like dormant bees revived by spring sunshine, separate and dart to and fro. If confined in an air-tight vessel, the molecules have their flights curtailed, and beat more and more violently against their prison walls, so that every square inch of the vessel is subjected to a rising pressure. We may compare the action of the steam molecules to that of bullets fired from a machine-gun at a plate mounted on a spring. The faster the bullets came, the greater would be the continuous compression of the spring. 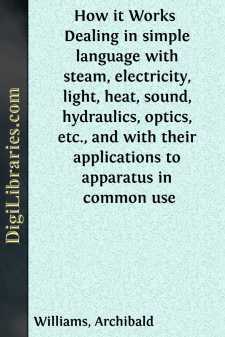 THE MECHANICAL ENERGY OF STEAM. If steam is let into one end of a cylinder behind an air-tight but freely-moving piston, it will bombard the walls of the cylinder and the piston; and if the united push of the molecules on the one side of the latter is greater than the resistance on the other side opposing its motion, the piston must move. Having thus partly got their liberty, the molecules become less active, and do not rush about so vigorously. The pressure on the piston decreases as it moves. But if the piston were driven back to its original position against the force of the steam, the molecular activity—that is, pressure—would be restored. We are here assuming that no heat has passed through the cylinder or piston and been radiated into the air; for any loss of heat means loss of energy, since heat is energy.